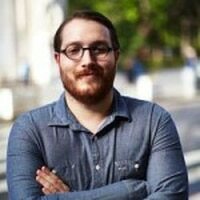 Put this in a regular evening rotation for the next six months, alongside your space heater. We have officially entered the soup months. Days of cold, rainy weather are upon us, with no end in sight and only big steaming bowls of hot liquid to steel us against the creeping chill. Thank goodness, then, for XinhXinh, a newly opened Vietnamese restaurant in the burgeoning strip of small businesses on Southeast 10th Avenue and Madison Street (neighbors include CBD chocolate purveyors Grön and Wasabi PDX, home of the sushirrito and sushi doughnut.) Pronounced "sin-sin"—the word means "cute" in Vietnamese—it's a sister restaurant to Pho Vi Van in Vancouver, which XinhXinh founder Linh Van opened in 2014. XinhXinh makes humble use of a prefab restaurant space, offering some 30 seats, including an adorable five-top bar adorned with plants, beers and tea pots, plus a couple of two-tops outside, in case you catch your pho on a sunny day. 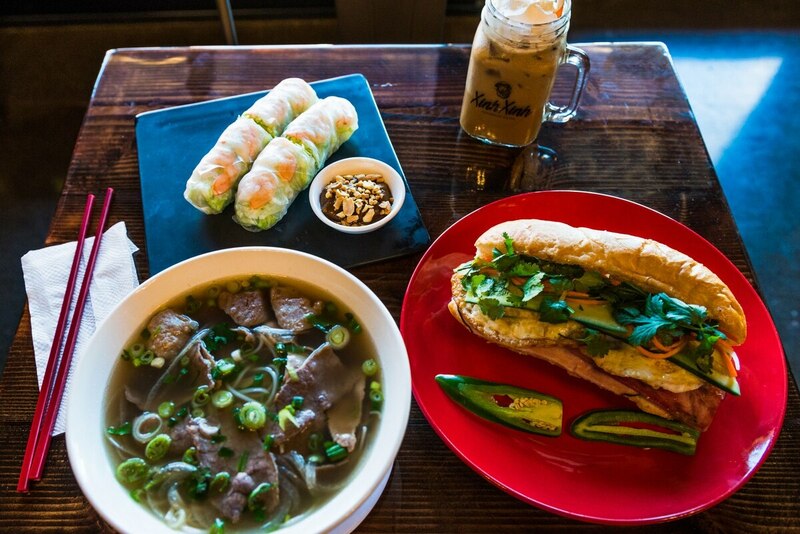 The menu here is a classic Vietnamese-American deli/soup-shop hybrid, with a range of banh mi, pho and vermicelli bowl offerings accompanied by varying broths and proteins. But let's start with the soup. XinhXinh's signature Cowabunga Pho ($12) comes fully loaded with meatballs, lean brisket and eye-round steak served in beef broth. Notably, there's no tripe or tendon included. The soup here is perhaps more delicate than that at other spots around town, with less emphasis on anise and more clean, herbal notes. I really liked the veggie pho ($10) as well, a light, airy bowl overflowing with fresh broccoli, carrots, bok choy, mushrooms and green onions. Fully vegan and decidedly tasty, it's some of best vegetarian pho in town. 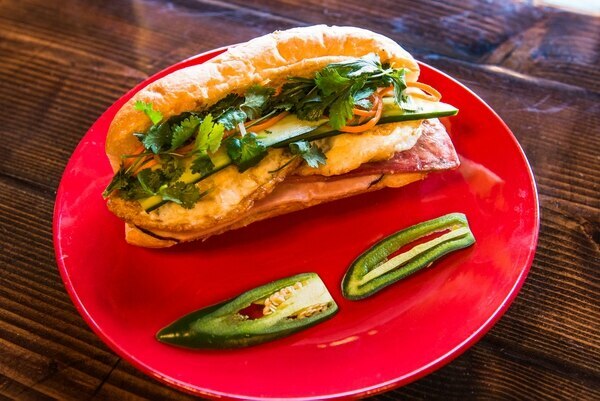 On the sandwich side, the shop's flagship banh mi, the XinhXinh Classic ($10), is stuffed to bursting with pâté, layers of lunch meat, two eggs and heaps of fresh and pickled veggies. A smaller, more traditional one meat banh mi runs $7, and the bread for all these sandwiches comes from a local bakery—XinhXinh's staff declined to disclose which one. This is much what you'd expect: a good sandwich at a reasonable price, though perhaps a few dollars more than what you'd find along 82nd or up in Vancouver. There are surprises, however. A pot of tea ($4) comes in a stunning low, wide-cast iron pot adorned with koi, and is served with a single charming caramel macaron, whose bakery provenance is also a secret. The starter "Spicy/Crispy" banh mi is, in fact, an open-faced sandwich, baked in the oven and adorned with pork floss and spicy sauce. The Crunchy Salad is a pre-dressed bowl of cabbage in a wonderful fish sauce and honey vinaigrette, tossed with a choice of grilled pork, shrimp chicken or tofu (get the pork). Crunchy, savory and sweet all at once, with a wonderful acidity from the vinaigrette, this is the best dish at XinhXinh so far. A small wine list was added on my last visit, along with beers from Ninkasi, Widmer and Heineken. But the best beverage I tried here was actually a milkshake—XinhXinh's faithful version of the traditional avocado shake is a standout ($5), as is the delicious blueberry variation ($6). Elsewhere on the menu, there are a few misses. Avoid the shrimp here at all costs, which I had on an entirely unremarkable vermicelli bowl—they are shriveled and obviously pre-frozen budget morsels of mealy mush. And be wary of straying from the pho options on the soup menu—the satay noodle soup ($12) was like liquid peanut butter, and I found the chicken curry soup ($11) a tad bland. 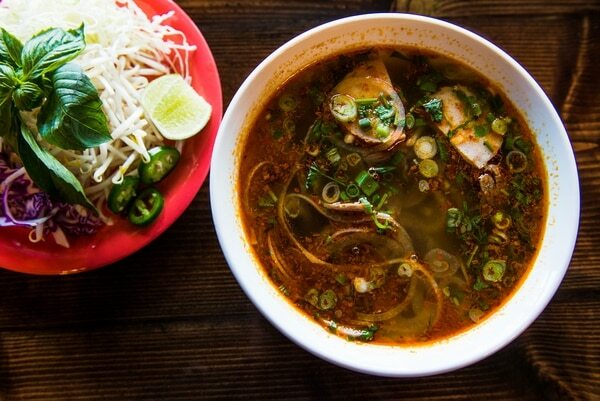 Stick to pho basics here—this is not Ha VL, where soupy adventurism is rewarded. But for standards and unlikely standouts, at reasonable prices and conveniently located in Southeast Portland, XinhXinh is a winner. Put this in a regular evening rotation for the next six months, alongside your space heater.